What creates the commonality in quilters' hearts...our passion to create, our desire for the creations themselves and how they somehow represent us, or the need for community and fellowship we gain when joing other quilters...whether in quilting groups or online? As I have learned to sew, learned to quilt, and learned to share my quilts and quilt with other women of like minds and sharing hearts, I have learned so much about...not only other quilters but about my own self, my own heart and it's need to contribute, to share and to give. 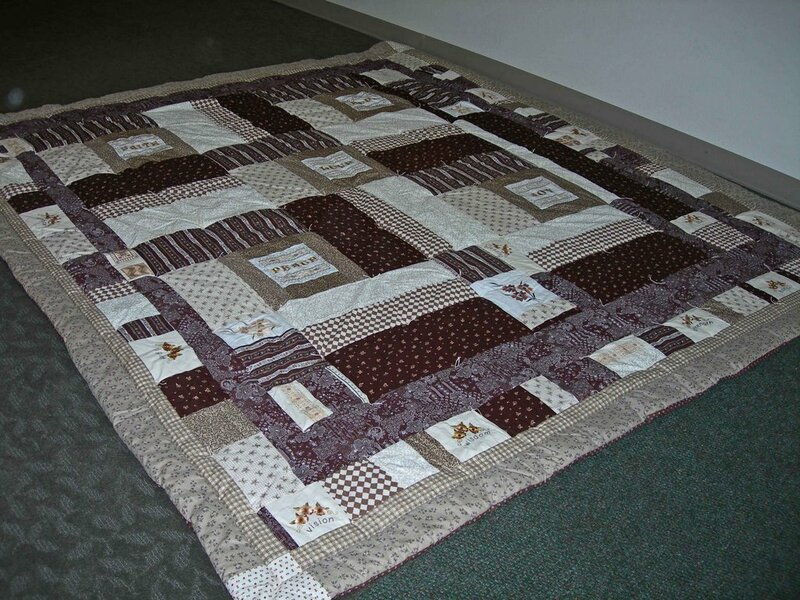 One of the very first opportunities that I was blessed with, was being given an entire quilt top by a 'drop-in' quilter. She had started this beautiful quilt in honor of her mother. Suddenly, on top of her own health problems, the quilt became bigger than what she was capable of working with. She gave it to me and asked me if I could finish it for her. I was overwhelmed with her story, the loss of her mother, and all of the emotions that all of that creates. I felt so honored to finish it for her. It had many, many beautiful machine embroidery blocks on it. Each one saying lovely things like 'love','hope','charity','vision', 'wisdom' or 'light'. The top was exquisite and all I had to do was add sashings, borders, cornerstones and piece a back and then finish it off. It took me longer to do that, then to make one of my own quilts from scratch. Somehow, there was so much giving in that quilt, so much giving of the gift of it to me to finish, that I was also overwhelmed. When I finally completed it, our group donated it to the Union Gospel Mission's Fall Auction. I have learned that the gift of the heart itself, in the quilt is as big, if not bigger, than the gift of the quilt.